These baby circus elephants are just too hard to resist. All decked out in their circus attire and each with a colorful ball, They are ready to perform at your table! Covered sugar with matching cream pitcher. Made of hand painted glazed ceramic by Simpson giftware, and are in pristine condition. The sugar has a cutout in the lid for your spoon. Sugar bowl measures 5" tall. 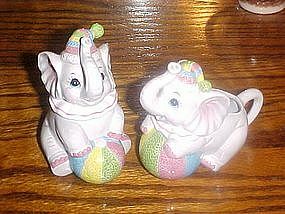 An adorable addition to your elephant collection or your creamer collection.THey are actually a darker gray than the photo shows.